I know I shouldn't waste my time on this buffoon, but I simply can't help myself. Alan Dershowitz - Attorney General of Hasbara and Warmongering - has once again taken to the pages of the Wall Street Journal (along with an extended cut-and-paste job in David Horowitz's neocon rag FrontPageMag) to advocate for an Israeli or American military attack on Iran. It appears that Dershowitz is now attempting to claim that a "preventative" attack on Iran is actually merely "reactive" on the part of Israel (or the U.S.) and goes to great disingenuous lengths to paint Iran as the aggressor - casting nuclear-armed Israel and its super-power patron, as usual, as mere victims of Iranian violence based upon allegations made by Benjamin Netanyahu blaming the Iranian government for recent terrorist attacks in Georgia and Thailand. After using intellectually dishonest tactics to paint Iran as an aggressor against Israel (and, bizarrely, all Jewish people worldwide) and citing Article 51 of the UN Charter to argue for legal retaliatory military actions if Iran attacks a foreign country, Dershowitz writes, "This is not to argue against such an attack if Iran decides not to go after soft American targets. It may become necessary for our military to target Iranian nuclear facilities if economic sanctions and diplomatic efforts do not succeed and if the Iranian government decides to cross red lines..."
To say that his understanding, invocation, and defense of "preventative" military action is totally incorrect would be an understatement. He is expressly advocating a first strike by the U.S. (and later expands this advocacy to an Israeli assault) which is - by any stretch of international law - a wholly illegal action that has long been considered "the supreme international crime." 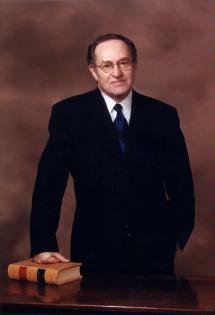 It is additionally ironic for Dershowitz to invoke the UN Charter in making his grotesque arguments that absolve Israel and the U.S. of all past and potential violations of international law yet holds the Iranian government and people collectively accountable for any blog post suggesting Iran itself use military force. Whereas he uses Article 51 to make his case, he suggests the US explicitly violate Article 2 of that very same document. Article 2, as we know, states that all UN members "shall refrain in their international relations from the threat or use of force against the territorial integrity or political independence of any state..." Yet, what does Dershowitz call for? He insists the US government attempt to deter Iran from weaponizing its nuclear program (note the unstated admission that Iran has no nuclear weapons program!) by providing a "credible" "threat of military action." While it is becoming clear that Dershowitz is increasingly (and rightly) seen as not only a serial liar and a reflexive and shameless apologist for anything Israel does (or wants to do), but also as a completely morally bankrupt person, that doesn't mean his influence is irrelevant. Speaking in opposition to a recent human rights conference held at the University of Pennsylvania, Dershowitz claimed that he is in regular contact with both Netanyahu and Obama. Indeed, Dershowitz is an attention-seeker and self-aggrandizer, but I still wouldn't be surprised if his boast were partially true. Most notably, however, is the fact that Dershowitz has recently taken up the mantle as a defender of the Mujahadeen-e-Khalq (MEK). Speaking in Washington DC earlier this month (fresh from decrying the PennBDS Conference), Dershowitz called himself a "human rights activist" and called for the MEK to be delisted as a terrorist organization. This alone, as Holder v. Humanitarian Law Project affirms, is tantamount to "material support" for a designated terrorist group. That Dershowitz was surely paid for his endorsement puts him in league with Howard Dean, Mike Mukasey, Rudy Giuliani, Lee Hamilton, and Wesley Clark, along with numerous former government officials and current members of Congress as defending a known terrorist cult which has recently been implicated in the murders of Iranian scientists, with substantial backing and training from Israel. If true, a more perfect definition of Israel as a "state sponsor of terrorism" could not be found. He even invoked the Holocaust in his plea for ensuring the "physical safety" of MEK members in Iraq and declared that the US government and its citizens "are friends with people at Camp Ashraf" and are bound to "protect them." So, at what point will Alan Dershowitz be charged with aiding a foreign terrorist organization? Nima, it is important that you continue to 'waste...time'to point out the flaws of people like Dershowitz as he is very influential in his other ventures of so called humanitarian endeavours, but like a rotten sandwich, good only in spots, that does not excuse his demonizing Iran and marching in lockstep with Israel in their attempt to start a third war in the Middle East. With the US through Obama also marching in 'lockstep' with Israel as he said recently, but I do not think he understands that marching in 'lockstep' indicates blind obedience to irrationality. I did respect Dershowitz at one time, but his support for the Zionists state of Israel that is built on Palestinian bloodshed has nullified for me any good he has done. So, you just keep wasting time exposing these charlatans however respected they are by the powers that be or by the establishment. my support for julian assange definitely flagged after they hired dershowitz as their american counsel.